Speech by Kofi Annan, Nobel Peace Prize laureate, Chairman of the Elders and the Kofi Annan Foundation at the Citizens’ Manifesto Forum in Harare, Zimbabwe on 20 July 2018. Africa has been through a series of momentous changes. First came decolonisation. Then came a second wave, too often marked by tyranny and economic stagnation. I believe that a new era is now in prospect, Africa’s third wave. Let us make this third wave one of lasting peace, based on democracy, human rights, and sustainable development. These words may already be familiar to you. That is because I spoke them in 1997, right here in Harare. I had come to address the annual assembly of heads of state and governments of what was then the Organisation of African Unity as the new Secretary-General of the United Nations. Zimbabwe was then, and remains, a very special country, close to my heart. But after I delivered that speech twenty years ago, Zimbabwe fell under more and more authoritarian rule. The population’s human rights were increasingly denied. Elections were marred by intimidation and violence. Zimbabwe’s economy shrank by half. It lost its status as “the breadbasket of Africa”. It stopped attracting talent and capital from all over the world. Instead, millions of the young and talented left the country, fleeing growing repression and poverty. In other words, rather than embodying the third wave I was calling for, Zimbabwe got stuck in the second wave. Your Citizens’ Manifesto is testimony to the fact that the aspirations of the Third Wave remain unmet, but are as strong as ever. The fact that we can hold this event just 10 days before the first round of the elections, the fact that the opposition has generally been able to campaign freely across the country, the fact that, for the first time in many years, international observers, as well as the Elders, have been invited – all these are signs that, from the Limpopo to the Zambezi, a new spirit of freedom is in the air. To his credit, the President has promised free, fair and peaceful elections. Take him at his word. Make the most of this opportunity, even if the conditions may fall short of ideal. One of the things I like about your manifesto is that it stresses the importance of active participation by the citizens of this country. Too often on the continent we have put all our hopes in one man. It has seldom been a woman. But no man can single-handedly turn a country around. And giving one man too much power is a recipe for disaster, as both world and African history can testify. Rebuilding Zimbabwe will be the work of the Nation. A nation made up not just of politicians, but also of professionals, of traders and students and workers, a nation of men and women like you. Politics is too important to be left to the politicians. Democracy is about ensuring the constant participation and consultation of the people, and not just once every few years when their votes are needed. Yes, it is about elections, to be sure, and I urge all of you to vote on 30 July to make your voice count. Tweeting and posting are not enough: you have to go vote! But the elections will just be the starting point of a long process of national renewal. For democracy to thrive, a country needs not just elections, but also the separation of powers, the rule of law, respect of the constitution and the enjoyment of the fundamental freedoms. This manifesto is a meritorious example of citizens taking the initiative. It is doubly praise-worthy that it started before the transition of November 2017. If the leaders fail to lead, the people can lead and make them follow, and that is what you are trying to do with this manifesto, whoever wins the elections. We, the Elders, have come to support you today. 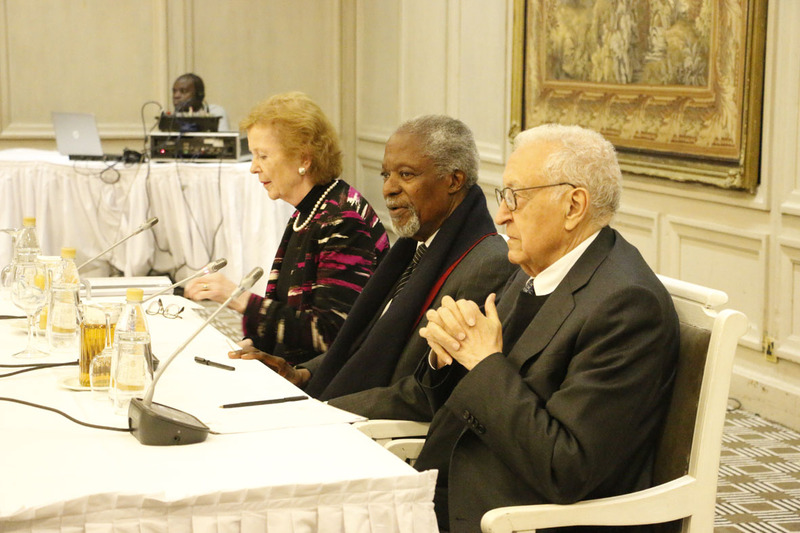 The Elders are an independent group of global leaders who promote peace and human rights. We were brought together by Nelson Mandela, whose memory we have just celebrated in South Africa. The Elders have come to support the people of Zimbabwe as you try to navigate your way to a better tomorrow, free from want, and free from fear. We must remember that all healthy democratic societies are built on three pillars: peace and security, sustainable development, and human rights and rule of law. These pillars are interconnected and interdependent, for there can be no long-term security without development, and there can be no long-term development without security. And no society can long remain prosperous without the rule of law and respect for human rights. I urge you to make sure that my speech from 1997 will not be as relevant in twenty years as it is today. The third wave is on the horizon. We can all feel the swell. Catch this wave.